As may have been noticed, at the top of my Sewing Plans list is holiday gift sewing. This means sewing for others. This means lack of desire to actually get sewing accomplished. Or, rather, lack of interest in prepping the pattern to get sewing accomplished. I think once I get to my serger all will be well. Until then, I procrastinate. A lot. So much so that I have in fact read another book – Mastiff by Tamora Pierce. Frist off, I should say that I have been reading Tamora Pierce’s works since the age of eleven. Without a doubt the target audience of her books are pre-teen and teenage girls (perhaps a bit more toward the teen depending upon maturity levels), but I decided long ago that as long as she keeps writing ’em, I am going to keep reading ’em. She was one of the first authors I really loved to read, and so I suppose I shall always have a soft spot for her books. In any case, even as I age, I still appreciate her stories and characters and continue to enjoy her books. Tamora Pierce has created two main worlds in which her characters and magic systems exist. One is the home of the Circle of Magic books, and the other is Tortall, which has been home to a wonderful assortment of knights, mages, scoundrels, and nobility. While the setting remains the same, the characters and their stories have been excitingly different. It has been interesting to see how the beliefs and customs in this world have changed over time, while other things have remained very much consistent throughout the timeframe covered by her works. Typically, in her Tortallian stories, Pierce creates a female character and follows their path to greatness through two, three, or four books. Mastiff is the third and final book in the Beka Cooper series, which details the progress of Beka Cooper as she gains position in Tortall’s police force. Unlike Tamora Pierce’s other books, the Cooper stories are written journal style in first person. 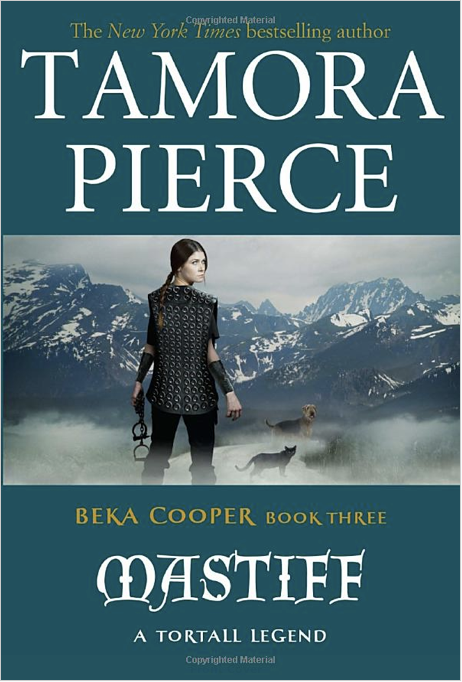 Since Beka Cooper is one of Tamora Pierce’s few shyer, quieter characters, this is an excellent way to understand and connect with the character, although she may not speak as much as many of the other characters in the story. The Beka Cooper stories date back the furthest in the Tortall collections thus far; so it is interesting to see how things have changed between her time on Tortall’s police force and later in the timeline when Alanna must struggle to gain acceptance as a lady knight. Beka’s earlier stories detail her learning and growing into her position as a law keeper of the realm, but Mastiff highlights how skilled and mature she has become. This is without a doubt the most exciting of the three novels, as the stakes have never been higher and it pushes Beka and all of her companions to the limit. I won’t deny that there may have been more than once during the reading of this book that caused me to get a little teary-eyed, a few moments that had me bouncing in glee, and more than a few moments that left me screaming at the book and wanting to throw it against the wall. And, despite seeing a few things coming a mile off, that still didn’t affect my reaction once they actually turned up in the plot. Which speaks volumes about how easy it is to get wrapped up in the story and empathize with Pierce’s characters. I suppose it isn’t a surprise then, that this books kept me up well past bed-time three nights running. And I have to say – totally worth it. While Beka Cooper isn’t my favorite of the Tortallian legends (my favorite stories are in The Immortals Quartet), I still thoroughly enjoyed reading her story and watching her journey. I love how her tale, despite being a century removed from most of the other events in the Tortallian legends, is still connected and important to those future events. As always, I greatly enjoyed the cast of characters, the exciting events, and the constant snark that is so prevalent in Tamora Pierce’s work. All in all this book was quite satisfying, and I found it thoroughly enjoyable. A complete list of Tamora Pierce’s works can be found here. In general I would recommend the Circle of Magic books at about ages 10 and up, and the Tortall books to ages 12 and up. I highly recommend them to anyone interested in fantasy writing, even if you are over the target age range, as the characters, magic, and stories are wonderful. I would also recommend reading them in the order of publication (Tortall: The Song of the Lioness Quartet, The Immortals Quartet, The Protector of the Small Quartet, The Trickster Series, the Beka Cooper Trilogy; Circle: The Circle of Magic Quartet, The Circle Opens Quartet, The Will of the Empress, Melting Stones), as many of the events in the later books refer to characters and events of the earlier books, and it is more fun for the reader if they can see all of the connections and cameo appearances. I am still working on reading her short story collection, as I have been reading it slowly, rather than in one gulp as with the Beka Cooper book, but I will review that book as well once I have completed it. Thanks for sharing your review! Pierce was one of my absolute favorite writers when I was younger, and I wondered how this series was! Sounds like wonderful winterbound reading!